An image captured from footage taken by a video camera April 12 inside the Home Depot in Iwilei shows murder suspect Kirk Lankford, a police officer testified yesterday. A Honolulu police officer identified accused killer Kirk Matthew Lankford yesterday in store surveillance videos purchasing garbage bags, gloves, a shovel and other items on the day presumed murder victim Masumi Watanabe was last seen. Lankford, 23, is on trial for murder in Circuit Court. The surveillance videos came from Foodland Super Market in Pupukea and the Home Depot in Iwilei. The Foodland video shows a Hauoli Termite & Pest Control truck enter the store parking lot at 11:14 a.m. April 12. At the time, Lankford was a Hauoli pest control technician. A witness previously testified she saw Watanabe, 21, enter a Hauoli truck on Pupukea Road at about 9:40 a.m. Watanabe has not been seen since. In the video, the driver, wearing a dark cap and coveralls, enters the store and purchases garbage bags, paper towels, spray bleach and a beverage. 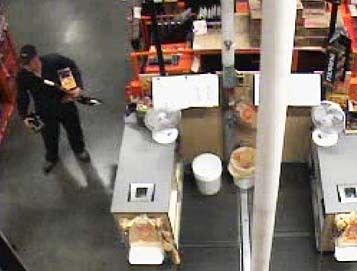 The Home Depot video, from 10:11 that night, shows a man in a dark cap and coveralls purchase heavy-duty garbage bags, gloves, a flashlight, a shovel and duct tape. Another witness had identified Lankford earlier as the man he saw digging a hole at Kahana Bay fishpond at about midnight on the day Watanabe disappeared. The witness said the man was digging by flashlight, wearing new gloves and using a new shovel. Honolulu police officer Calvin Sung testified yesterday he had met Lankford in person several times before. He said it is Lankford on the store videos. "Yes, sir, I was positive it was him," Sung said.